SAN LUIS OBISPO — A senior project by four Cal Poly mechanical engineering students won a national engineering competition and its $2,000 top prize for an air-conditioning system that uses reclaimed rainfall while trimming household energy costs. 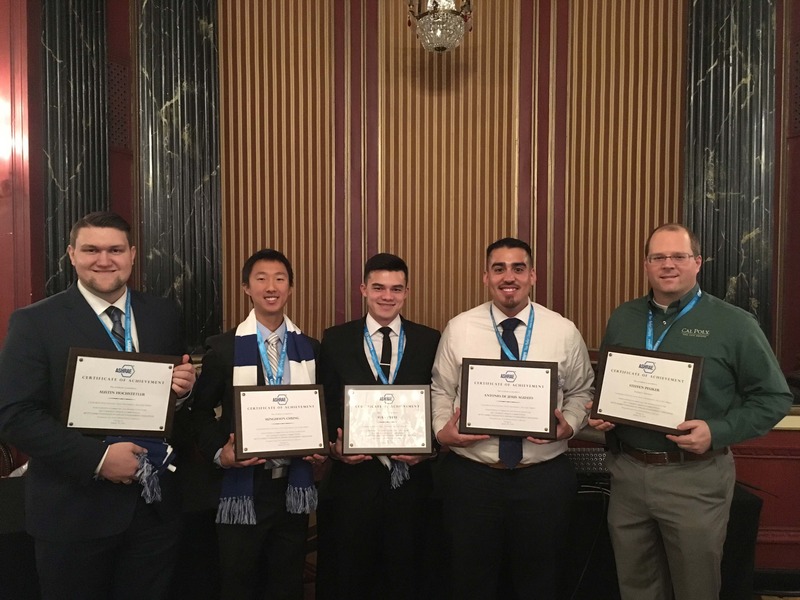 The Cal Poly team of Sunghood Chung (Seattle), Austin Hochstetler (Redwood City, Calif.), Sean Bybee (Torrance, Calif.) and Antonio De Jesus Aguayo (Santa Maria, Calif.) received first place in the 2017 Applied Engineering Challenge held by the American Society of Heating Refrigeration and Air Conditioning Engineering (ASHRAE). Professors Steffen Peuker and Jesse Maddren served as their faculty advisors. The design competition award recognizes outstanding student design projects, encourages them to become involved in the profession, promotes teamwork and allows students to apply their knowledge of practical design. It was the third time in four years that Cal Poly took the top honor. The award was presented Jan. 20 at ASHRAE’s winter conference in Chicago. Students were challenged to use evaporative cooling to reduce utility costs for low-income families living in Atlanta, where humidity levels range from 40 to 70 percent and summer temperatures regularly peak at 100 degrees. Based onspecific criteria, the team’s winning design lowered household energy consumption for household cooling by more than 20 percent. ASHRAE is a global society advancing human well-being through sustainable technology for the built environment. In 2012, as part of a rebranding, the organization formerly known as the American Society of Heating, Refrigerating and Air-Conditioning Engineers began doing business simply as ASHRAE to reflect its worldwide membership and services that continue to evolve globally. Team members who won the 2017 Applied Engineering Challenge held by the American Society of Heating Refrigeration and Air Conditioning Engineering (ASHRAE), from left, are Austin Hochstetler, Sunghoon Chung, Sean Bybee, and Antonio De Jesus Aguayo, with and faculty advisor Steffen Peuker.